Last night’s Survivor Series may have been divisive at times, but it was also undeniably iconic. It was exactly what many of us love about that specific PPV: the pops for the entrances, the spot-filled traditional matches, and the marquee main event. It’s not for everyone, but it’s certainly unique in its identity when stacked up against all the generic PPVs that fill out the rest of the year—did you know Roadblock is still a thing that’s happening? Survivor Series didn’t follow through on two of its potentially more intriguing stipulations, as both the Cruiserweight division and the Intercontinental Championship stayed with their current brands, but the PPV did manage to start moving things into place before the Road to Wrestlemania truly kicks off with the Royal Rumble in January. The biggest, and most controversial, outcome from Survivor Series is undoubtedly the fact that Goldberg destroyed Brock Lesnar in the main event, and in less than 90 seconds. It was a capital ‘M’ Moment, an iconic beatdown that brought the Toronto crowd to its feet, and tears to Goldberg’s eyes. The question after the dust had settled was simple: how can Raw build on not just the Goldberg moment, but the momentum earned from the show as a whole? This week’s Raw wastes little time in taking what made much of Survivor Series memorable, doubling down on the Goldberg factor while also doing a much better job of defining the main event scene in general. So, the episode starts by immediately raising the stakes for the next few months, as Goldberg comes to the ring and, after thanking his family and the fans, reveals that Stephanie McMahon floated the idea of another title run, so he’s decided to enter himself in the Royal Rumble match. That’s not only a great way to create more interest and storyline variability in the match itself, it’s a perfect extension of everything that happened the night before. If Goldberg can easily dominate Lesnar, one of WWE’s most feared competitors, why wouldn’t he put himself in a position to snag another title shot? When you consider the possible entrants as well, from Cena and Lesnar, to top guys like Dean Ambrose, Chris Jericho, and (sigh) Roman Reigns, suddenly there are a lot of potential stories to be told, which is already a marked improvement on last year’s build to Triple H’s return. The first half of Raw is largely filled with this kind of building on stories. For the first time in a long time, Raw gets off to a hot start and keeps things going throughout the night. So, early on, we get the tease of Y2J blaming Owens for nearly destroying his list and costing Raw their match the night before; we get Stephanie McMahon convincing Mick Foley to punish Sami Zayn for failing to win his match against The Miz; and we get a Cruiserweight match that’s actually fun. Those are all great steps forward because they’re rooted in moving the stories in new and interesting directions, be it the story of Jericho and Owens’ friendship, or the idea of their being consequences for anyone on the Raw roster that didn’t step up at Survivor Series. Now, if only those stories weren’t hindered by other details, like the fact that Sami didn’t exactly lose his match clean. That doesn’t seem to matter to Stephanie, but at least Mick has some compassion later and ends his match with Braun Strowman before the beloved Canadian dies in his home country. Then there’s the Cruiserweight match, which does allow Cedric Alexander to show off his stuff, and yet also allows Davari to lean into that incredibly dated, horrific, offensive racial stereotype that shouldn’t pass as a gimmick in 2016. Also, there’s the troubling tag team title match between New Day and Cesaro and Sheamus. It’s an incredible match, no doubt. Cesaro puts on the performance of a lifetime—when doesn’t he?—and him and Sheamus show, once again, that they’re a legit threat as a team. Alas, WWE seems fixated on keeping the New Day title streak intact, no matter how detrimental it is to the story being told. Look, New Day winning by some Xavier Woods distraction and interference can work if it means New Day keeps leaning more and more on heel tactics to win matches. But that’s not what this feels like. Instead, it feels like WWE running matches that kill time and don’t mean anything, and that actively avoid the way they should be telling stories. This isn’t a smarky complaint or an attempt at fantasy booking, but rather an analysis of what’s been put in place and how it’s failing miserably. New Day have come up against one threat after another, and should have lost on numerous occasions. The Club should have received a rub, and now it’s Cesaro and Sheamus getting shafted, their legitimately compelling and emotional arc about coming together cut off at nearly every turn. No wonder Cesaro tweets. So, this isn’t a perfect Raw by any means, but it is a substantial improvement on previous episodes, and the best episode since the brand split. For once WWE books Rusev correctly and has him squash the hell out of Enzo Amore, and Braun Strowman continues to trend in the right direction, looking like a pure monster against Sami Zayn. There’s even hope in the Cruiserweight division, because Rich Swann gets a win against TJ Perkins and Noam Dar, securing himself a title shot during the debut episode of 205 Live. 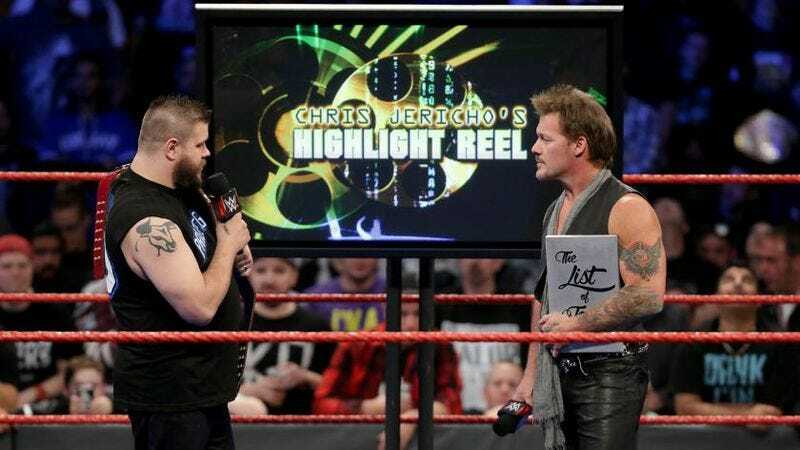 But make no mistake about it: there’s nothing better on Raw right now than the enduring friendship of Kevin Owens and Chris Jericho. This week, their friendship nearly comes to an end when it looks like, during a particularly somber Highlight Reel, that Y2J is going to blame the Survivor Series loss on the Universal Champion. Then, after expertly teasing that breakup, which stokes the fires for that feud at a later date, they place the blame solely on Roman Reigns before detailing his ineptitude, which may or may not be caused by an excess of hair conditioner. It’s a segment that takes the crowd through every single emotion, and arrives at the necessary conclusion of seeing these two best friends continue to recognize that they’re better off together. Plus, it leads to a No Disqualification match for the Universal Championship in the main event against Seth Rollins, which not only gives Jericho a chance to execute a HUGE troll in the form of showing up in a Sin Cara mask, but also gives Rollins a chance to be the version of himself that we all love; the one with a purpose, intensity, and in-ring dynamism. That is the babyface Seth Rollins we’ve all been waiting for, and it comes during a main event worthy of a PPV. It’s a match that helps turn a good Raw into a great Raw. Results: New Day (c) defeated Cesaro and Sheamus (Tag Team Championship match); Cedric Alexander defeated Ariya Daivari; Rusev defeated Enzo Amore; Gallows and Anderson defeated Golden Truth; Braun Strowman defeated Sami Zayn; Bayley and Sasha Banks defeated Charlotte and Nia Jax; Rich Swann defeated Noam Dar and TJ Perkins; Kevin Owens (c) defeated Seth Rollins (Universal Championship match). So, who’s excited to see Gallows and Anderson lose to New Day next week? It’d be cool if Rusev could get a feud that didn’t involve defending his wife’s honor. The near-total absence of Roman Reigns tonight was beautiful. A reaction to the reception he got at Survivor Series? The Gallows and Anderson vs. Golden Truth match was a whole lot of nothing, but I’m never going to argue with Goldust getting a hot tag. So first Roman Reigns doesn’t run to the ring during the Highlight Reel to help Rollins, then he doesn’t come out during the main event when Y2J interferes. The Big Dog is unreliable, and clearly not a good friend like those two beautiful Canadians. Cesaro caught Big E in midair. My jaw hit the floor.